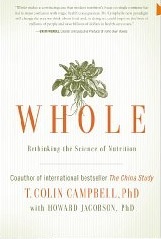 I have just completed reading Colin T Campbell’s new book “WHOLE”, his follow up to his best selling book on nutrition, “THE CHINA STUDY”. Can I urge you to purchase the book as I feel it is an absolute must read for anyone who is truly interested in learning about the path towards optimal health. Below is the full transcript of the Introduction to “WHOLE”, written by Colin T Campbell himself. I am sure that if you take the time to read it, you will be encourage to purchase the book for yourself and so be better informed about health and the way to find it. In 1965, my academic career looked promising. After four years as a research associate at MIT, I was settling into my new office at Virginia Tech’s Department of Biochemistry and Nutrition. Finally, I was a real professor! My research agenda couldn’t have been more noble: end childhood malnutrition in poor countries by figuring out how to get more high-quality protein into their diets. My arena was the Philippines, thanks to a generous grant from the U.S. State Department’s Agency for International Development. The first challenge was to find a locally produced, inexpensive protein source. (Even though malnutrition is largely an issue of not getting enough calories overall, in the mid-1960s we thought that calories from protein were somehow special.) The second challenge was to develop a series of self-help centers around the country where we could show mothers how to raise their children out of malnutrition by using that protein source. My team and I chose peanuts, which are rich in protein and can grow under lots of different conditions. At the same time, I was working on another project at the request of my department chair, Dean Charlie Engel. Charlie had secured U.S. Department of Agriculture funding to study aflatoxin, a cancer-causing chemical produced by a fungus Aspergillus flavus, and my job was to learn all I could about how the fungus grew so we could prevent it from growing on various food sources. This was clearly an important project, as there was quite a bit of evidence that Aspergillus flavus caused liver cancer in lab rats (the mainstream assumption was, and still is to this day, that anything that causes cancer in rats or mice probably also causes cancer in humans). One of the main foods Aspergillus flavus contaminates is peanuts, and so, in one of those cosmic coincidences that appears amazing only years later, I found myself studying peanuts in two completely different contexts simultaneously. And what I found when I looked deeply into these two seemingly unrelated issues (protein deficiency among the poor children of the Philippines and the conditions under which Aspergillus flavus grows) started to shake my world and caused me to question many of the bedrock assumptions on which I and most other nutritional scientists had built our careers. Here’s the main finding that turned my worldview—and ultimately, my world—upside down: the children in the Philippines who ate the highest-protein diets were the ones most likely to get liver cancer—even though the children with high-protein diets were significantly wealthier and had better access to all the things we typically associate with childhood health, like medical care and clean water. I chose to follow this discovery everywhere it led me. As a result, the trajectory of my career veered in unexpected and unsettling directions, many of which are detailed in my first book, The China Study. I ultimately became aware of two things: First, nutrition is the master key to human health. Second, what most of us think of as proper nutrition—isn’t. If you want to live free of cancer, heart disease, and diabetes for your entire life, that power is in your hands (and your knife and fork). But, sadly, medical schools, hospitals, and government health agencies continue to treat nutrition as if it plays only a minor role in health. And no wonder: the standard Western diet, along with its trendy “low fat” and “low carb” cousins, is actually the cause, not the cure, of most of what ails us. In a nutshell, the “miracle cure” science has been chasing for the past half century turns out not to be a new wonder drug painstakingly formulated after decades of brilliant and relentless lab work, or a cutting-edge surgical tool, or technique using lasers and nanotechnology, or some transformation of our DNA that will turn us all into immortal Apollos and Venuses. Instead, the secret of health has been in front of us all along, in the guise of a simple and perhaps boring word: nutrition. When it comes to our health, it turns out the trump card is the food we put in our mouths each day. In the process of learning all this, I also learned something else very important: why most people didn’t know this already. The medical and scientific research establishments, far from embracing these findings, have systematically dismissed and even suppressed them. Few medical professionals are aware that our food choices can be far more effective shields against disease than the pills they prescribe. Few health journalists report the unambiguous good news about radiant health and disease prevention through diet. Few scientists are trained to look at the “big picture,” and instead specialize in scrutinizing single drops of data instead of comprehending meaningful rivers of wisdom. And paying the piper and calling the tune for all of them are the pharmaceutical and food industries, which are trying to convince us that salvation can be found in a pill or an enriched snack food made from plant fragments and artificial ingredients. The truth. How it’s been kept from you. And why. That’s what this book is all about. If you’ve read The China Study, you’ve heard some of this before. You know the truth about nutrition, and you’ve heard a little bit about the resistance other scientists and I have faced in trying to bring this truth to light. Since its publication in 2005, millions of people have read or read about The China Study and shared its insights with friends, neighbors, colleagues, and loved ones. Not a day goes by that I don’t hear grateful testimonials to the healing power of whole, plant-based foods. Anecdotal as each of these stories may be, the overall weight of their combined evidence is substantial. And each of them is more than ample compensation for the troubles and obstacles placed in my way by powerful interests who make money from our collective ignorance. Also, since 2005, many of my colleagues have conducted varied studies that show even more powerfully the effects of good eating on the various systems of the human body. At this point, any scientist, doctor, journalist, or policy maker who denies or minimizes the importance of a whole food, plant-based diet for individual and societal well-being simply isn’t looking clearly at the facts. There’s just too much good evidence to ignore anymore. And yet, in some ways, very little has changed. Most people still don’t know that the key to health and longevity is in their hands. Whether maliciously or, as is more often the case, due to ignorance, the mainstream of Western culture is hell-bent on ignoring, disbelieving, and, in some cases, actively twisting the truth about what we should be eating—so much so that it can be hard for us to believe that we’ve been lied to all these years. It’s often easier to simply accept what we’ve been told, rather than consider the possibility of a conspiracy of control, silence, and misinformation. And the only way to combat this perception is to show you how and why it happened. That’s why this new book felt necessary. The China Study focused on the evidence that tells us the whole food, plant-based diet is the healthiest human diet. Whole focuses on why it’s been so hard to bring that evidence to light—and on what still needs to happen for real change to take place. This book is split into four parts. The first, Part I, provides a little more information about my and others’ research on the whole food, plant-based diet, my reflections on some of the most prominent criticisms this research has received since the publication of The China Study, and more of my own background and journey, as context for understanding where the philosophies in this book have come from. Part II looks at the reason it’s so hard for so many not to just accept, but even notice, the health implications of this research: the mental prison, or paradigm, in which Western science and medicine operate, which makes it impossible to see the obvious facts that lie outside it. For many reasons, we now operate under a paradigm that looks for truth only in the smallest details, while entirely ignoring the big picture. The popular expression “can’t see the forest for the trees” makes the point well, except that there’s much more at stake here than just trees and forests. Modern science is so detail obsessed that we can’t see the forest for the vascular cambium and secondary phloem and so on. There’s nothing wrong with looking at details (I spent most of my research career doing just that); the trouble occurs when we start denying that there is a big picture, and stubbornly insist that the narrow reality we see, heavily laden with our own biases and experiences, is all there is. The fancy word for this obsession with minutiae is reductionism. And reductionism comes with its own seductive logic, so that people laboring under its spell can’t even see that there’s another way to look at the world. To reductionists, all other worldviews are unscientific, superstitious, sloppy, and not worthy of attention. All evidence gathered by non-reductionist means—presuming that research can get funding in the first place—is ignored or suppressed. Part III looks at the other side of this equation: the economic forces that reinforce and exploit this paradigm for their own self-interest as they chase financial success. These forces completely manipulate the public conversation about health and nutrition to suit their bottom line. We’ll look at the many ways money affects thousands of small decisions that add up to a big impact on what you, the public, hear (and don’t hear) and thus believe about health and nutrition. Last, in Part IV, we look at the totality of what’s at stake here, and what’s needed if we want things to change. I wanted to tell this story because I owe it to you, the public. If you are a U.S. taxpayer, you paid for my career in research, teaching, and policy making. I have known too many people, including friends and family, who suffered ill health unnecessarily, just because they did not know what I have come to know—and they also were taxpayers. You have a right to know what your money bought and a right to benefit from its findings. My own disclaimer: I have no financial interest in you believing me. I don’t sell health products, health seminars, or health coaching. I’m seventy-nine years old, I’ve had a long and rewarding career, and I’m not writing this book to make a buck. When you start talking about what you’ve learned from this book with your friends and you encounter passionate disdain for me and my motives (and you will! ), just consider the original source of the claims they’re citing. Ask yourself: What’s their financial interest? What do they have to gain from suppressing the information I share here? Telling this story has been a challenge. I know well that a diet consisting only of plants sounds like a wacky idea to many folks. But that’s starting to change. This idea becomes bigger and bigger with the passing of time. The current system is unsustainable. The only question is, will we free ourselves before it takes us down with it? Or will we continue to pollute our bodies, our minds, and our planet with the slag of that system until it collapses under its own economic weight and biological logic? In previous generations, how we ate appeared to be a personal and private matter. Our food choices didn’t seem to contribute much, one way or the other, to the well-being or suffering of other people, let alone animals, plant life, and the carrying capacity of the entire planet. But even if that were ever true, it no longer is. What we eat, individually and collectively, has repercussions far beyond our waistlines and blood pressure readings. No less than our future as a species hangs in the balance.